김회련 개국원종공신녹권(金懷鍊 開國原從功臣錄券)은 나라에 공이 있는 인물에게 공신으로 임명하는 증서로, 개국공신록권은 조선을 건국한 태조 이성계가 나라를 세우는데 공헌한 신하들에게 내린 것이다. 개국원종공신 제도는 조선시대에 개국공신을 늘리려는 의도에서 만들어진 일종의 새로운 포상제도로, 1392년부터 1397년까지 여러 차례에 걸쳐 1,400여 명에게 봉해졌다. 김회련은 도강 김씨이며, 조선을 건국한 태조 이성계의 창업을 도와 개국원종공신이 되었다. 그 후 홍주(현재의 홍성), 공주, 해주목사를 거쳐 한성판윤에 이르렀으며, 이조판서에 증직되었다. 시호는 충민이다. 태조 이성계는 조선을 창업하는데 공로가 있는 신하들에게 1392년 9월에 1 ·2 ·3등으로 나누어 개국공신에 임명하였고, 그 후에도 공신에 준하는 신하를 선발하여 개국공신으로 추가하여 임명하였다. 이 공신록권은 태조 4년(1395) 윤 9월에 김회련에게 임명한 「원종공신록권(原從功臣錄券)」으로 길이 956.4cm, 폭 31.0cm의 긴 종이에 기록된 원본이다. 그 내용을 보면 태조 원년(1392) 10월부터 태조 4년(1395)까지 여러 차례에 걸쳐 임명된 공신들의 선정경위가 열거되어 있으며, 특히 공신의 직명단자가 여기서만 기록되어 있다. 이 녹권을 통해 이성계의 조선건국에 참여한 세력들을 파악할 수 있으며, 공신록권을 발행한 공신도감의 성격을 규명하는데 도움이 된다. This certificate was awarded by the founder of the Joseon Dynasty, King Taejo (Yi Seong-gye), to Kim Hoe-ryeon (Dogang Kim Clan) upon his designation as a meritorious subject in recognition of his contribution to establishing the country. He later served as the magistrate of Hongju (Hongseong in present), Gongju, and Haeju, and as the mayor of Hanseong (Today’s Seoul), before being promoted to the Minister of Interior of Joseon. He was awarded the posthumous title of Chungmin. The Certificate of Meritorious Subject was issued under the award system created to expand the number of meritorious subjects during the Joseon Dynasty. In September 1392 King Taejo appointed a number of officials as meritorious subjects (1st, 2nd and 3rd classes) in recognition of their contributions to the establishment of the Joseon Dynasty, and thereafter it was awarded to as many as 1,400 people on several occasions between 1392 and 1397. 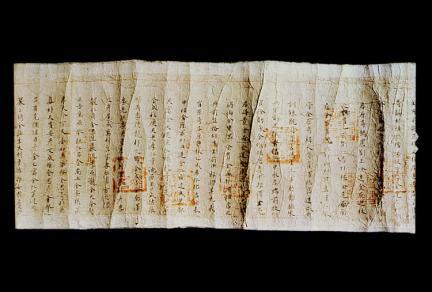 The certificate of meritorious subject issued to Kim Hoe-ryeon in September 1395 (the 4th year of the reign of King Taejo) is the original copy consisting of a scroll of paper measuring 9.25m in length and 3.03m in width. It contains a statement of the reasons for the appointment of meritorious subjects made between October 1392 and 1395 (from the 1st to the 4th year of the reign of King Taejong) as well as a list of their names. This document is an important record for identifying the illustrious figures who participated in founding the Joseon Dynasty together with Yi Seong-gye, as well as for defining the criteria for the issuance of certificates of meritorious retainers.